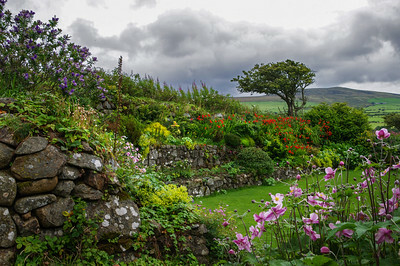 Photographs to inspire your gardening and your photography. 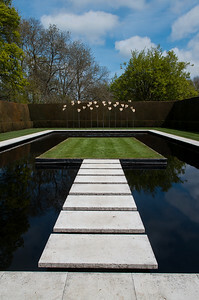 Contemporary reflective pond design with stepping stones, island and leaf fountain. 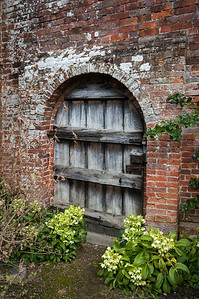 Location Kiftsgate Court Gardens. Octagonal courtyard fountain with medieval design. View through to garden trees beyond. Location Kiftsgate Court Gardens. 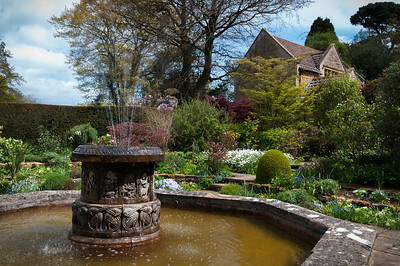 Octagonal courtyard fountain with medieval design. Location Kiftsgate Court Gardens. 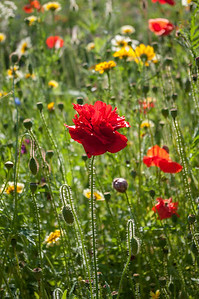 Red poppy standing out amongst blurred meadow flowers. 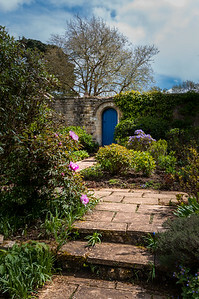 Garden path to blue door in wall. Location Kiftsgate Court Gardens. 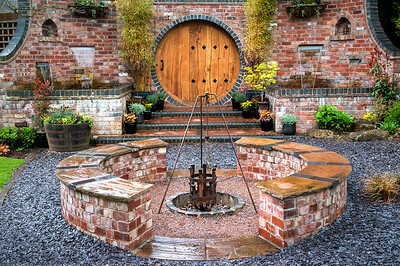 Fire pit, circular door, and water features at Whitlenge gardens created by Creative Designs. 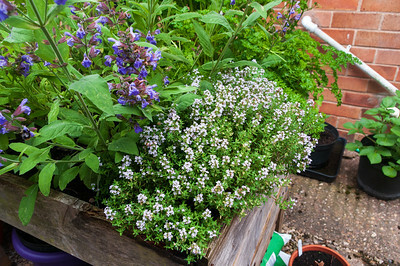 Visit the Whitlenge Gardens website for more information. 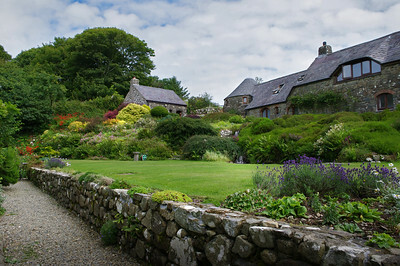 Windswept tree and rockery at Ffald-y-Brenin retreat centre in Pembrokeshire, Wales. 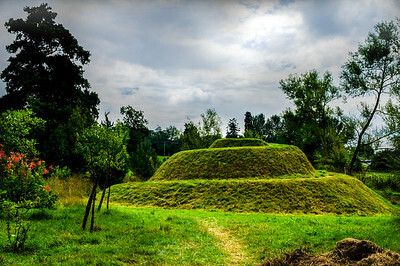 Spiral grassy mound garden feature. 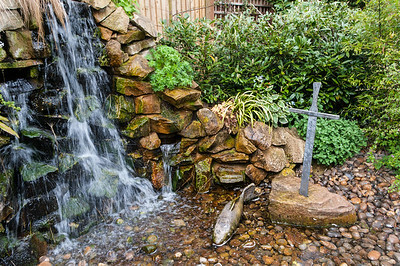 Waterfall and sword in the stone garden feature. 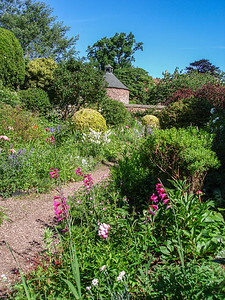 Garden path through herbaceous borders to dovecote. 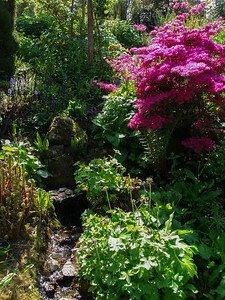 Trickling stream water feature descends through dense mixed planting. 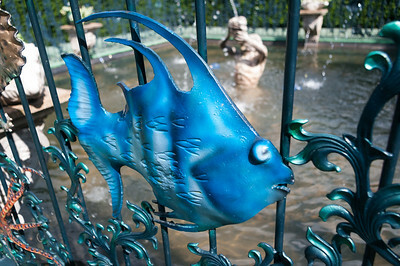 Decorative fish on railing of the Triton Pool, one of the twelve gardens at Ralph Court near Bromyard, Herefordshire. 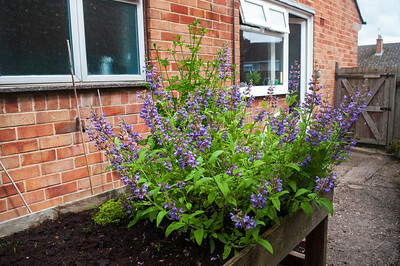 Visit the Ralph Court Gardens website for details of their themed gardens and opening times. 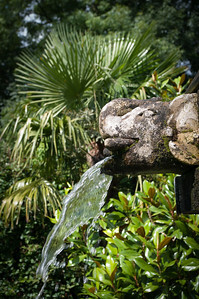 Elephant water spout at Ralph Court gadens, Edwyn Ralph, Bromyard, Herefordshire. 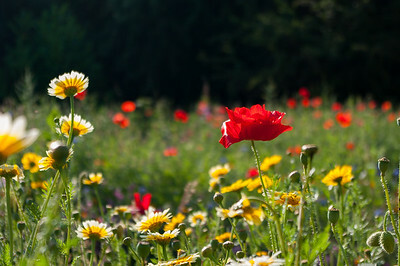 Visit the Ralph Court Gardens website for details of their themed gardens and opening times. 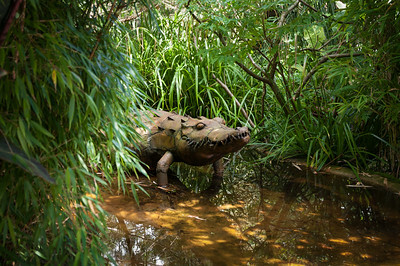 Crocodile sculture at Ralph Court Gardens, Bromyard, Herefordshire. 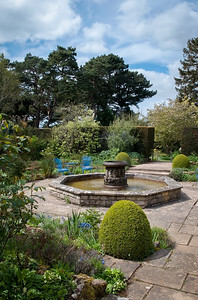 Visit the Ralph Court Gardens website for details of their themed gardens and opening times. 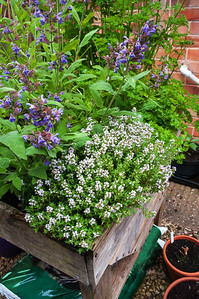 Thyme, sage and parsley in raised bed.